In order to spread the CTE: Learning that works for America brand message, states must educate district and local CTE educators, and then equip them to carry the branding message. Many states have provided local educators with an introduction to the brand and information about how to obtain the logo. Two states – Oregon and Mississippi – have been very organized and creative in their efforts to promote CTE at a grass roots level. Oregon's Department of Career and Technical Education has engaged in a two-year plan to implement the brand. The first year of the plan involved state staff learning about the brand and gaining experience using the brand logo and messaging. During the second year of the brand roll-out, state leaders began using the logo publicly, modified the look of their website, and conducted a one-day kickoff workshop for community college leaders, Oregon Department of Education staff, Community Colleges and Workforce Development staff, and CTE regional coordinators. Those who attended the workshop were introduced to the concept of branding, the CTE brand and ways to get the CTE message out. The workshop focused on the CTE logo and appropriate usage, but a great deal of time was also spent on the brand promise and brand messaging. Attendees created elevator speeches to demonstrate their understanding of the brand messaging. After the workshop, attendees participated in a three-part eLearning Module. Part one helped participants understand the meaning of the brand, part two explained the logo rules of usage, and part three provided educators with examples of how others use the brand. Those who complete the e-learning module and receive a passing score then receive the files with the logos. Oregon plans for its regional coordinators to serve as facilitators of the brand message. Regional coordinators carry the integrity of the brand and release the files to the teachers after they have passed the eLearning Module. All of the regional coordinators have committed that they will address any issues of improper logo usage. 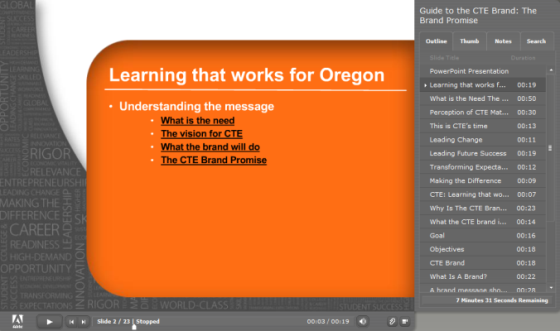 Oregon has developed a number of resources to help local educators become familiar with the brand and begin to use it. The Mississippi Research and Curriculum Unit has experienced extremely tight budgets in the past few years. In order to maximize their funding, they have focused their attention on getting local educators to promote the brand from a grass roots level. First, state leaders printed the brand posters with the Learning that works for Mississippi logo. They sent the posters to all of the secondary career education centers. They also presented a PowerPoint about the brand at the summer postsecondary conference. They have held Webinars with the CTE teachers, as well. All of these efforts were targeted at getting local educators to use the branding materials. Local educators are directed to the www.careertech.org website for the logo and the resources. In order to learn more about how schools are using the logo and resources, the state conducted a survey of local educators. They were disappointed to see little progress so far. As a result of the survey, though, they did discover that part of the reason teachers were not using the materials was that the information was not getting beyond regional directors to the teachers themselves. State CTE leaders have redoubled their efforts, and begun speaking directly to teachers. They have reminded schools of the brand PowerPoint they can take to rotary clubs and other presentations, and they have suggested that they take the posters, banners and success stories to open houses at the elementary and middle school levels. Local educators have also been encouraged to use the new logo as a bug on their school websites. Teachers are now talking about their excitement over the new look and message. In order to effectively engage local educators in communicating the brand message, each state should first communicate the benefits of a united national look, feel and message for CTE. Next, states should establish and clearly communicate the process by which local users can get the logo and the campaign materials. The resources provided by Oregon and Mississippi state CTE leaders should provide other states with a great starting point for engaging local educators in implementing the brand.